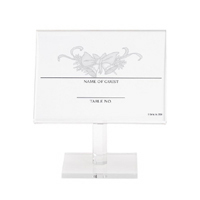 Clear acrylic frame holds placecard. 2.5" x 3.5", can be used as a mini frame later. Price is per frame. Must order in increments of 24.